Impress your chili-head friends by busting out this homemade Sriracha-style hot sauce! This project first appeared in MAKE Volume 38, on page 96. 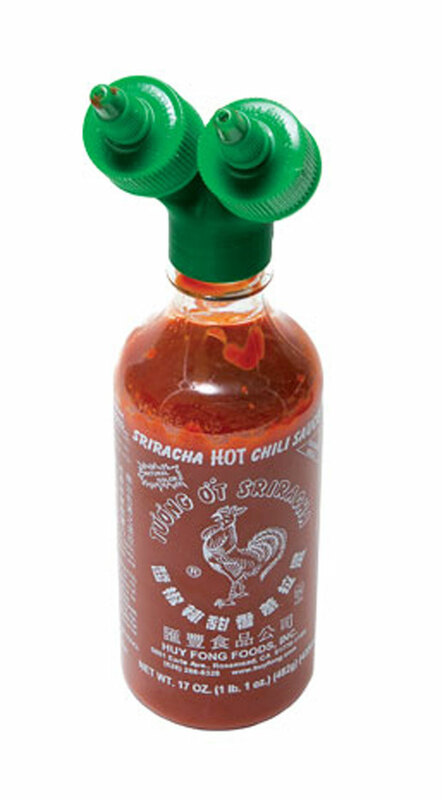 Sriracha pepper sauce as we know it today has been popularized by Huy Fong Foods in California and their big red bottle (complete with a giant rooster logo and bright green cap, making it easy to identify in your fridge). But the traditional Thai sauce, nam phrik si racha, has a rich history and is named after the coastal city Si Richa (or Sri Racha) in central Thailand’s Chonburi Province, where it’s a favorite on seafood. Here’s a version you can make in your own kitchen. I adapted the recipe from The Sriracha Cookbook by Randy Clemens. It’s not as spicy as the Huy Fong version, but you can adjust the heat to suit your taste. In any case, it gives you major street cred — especially when you bust it out in a swing-top stopper bottle or a Mason jar. 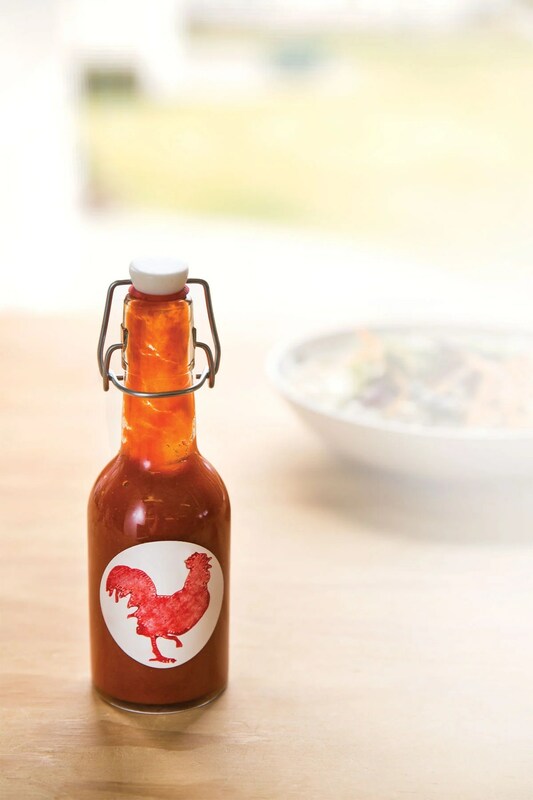 This sauce has a great, addicting flavor — hot, sweet, and garlicky — and just like the real “rooster sauce,” it tastes awesome on just about anything. Next time, I might try red serranos and a few extra Thai chilies to up the Scoville factor! 1¾ lbs ripe red chili peppers , Fresno, jalapeño, or serrano I used Fresno peppers here. Serranos are hotter. 3 Thai chili peppers for extra heat. Increase or decrease to taste. Bottles or jars For cool swing-top bottles try Specialty Bottle, specialtybottle.com. Also check out Cost Plus World Market, and a special Sriracha bottle from Etsy seller Libation Lab. 1. Prep the peppers and garlic. Step #1: Prep the peppers and garlic. CAUTION: Please wear gloves while handling chili peppers. Capsaicin can irritate your skin, eyes, nose, and mouth. Remove stems from chili peppers and halve lengthwise. Leave the seeds in. Capsaicin is the compound that makes peppers hot and it is most concentrated in the membranes surrounding the seeds. You’ll strain the seeds out later, so if you can handle the heat, leave everything in! Remove outer skin from cloves of garlic. I use the back of a knife: place the garlic clove on a hard surface, and then press down gently with the knife to crack the skin and help it come off easier. In your food processor, add peppers, granulated sugar, garlic powder, garlic, brown sugar, and salt. Pulse until a coarse puree forms. Transfer the mixture to a 1qt glass jar and seal. Store jar at room temperature. Stir daily, for 7 days. This allows a mild fermentation and allows all the flavors to develop. Step #5: Boil and simmer. Pour pepper mixture into small saucepan over medium heat. Add vinegar and bring to a boil. Lower heat and simmer gently for 5 minutes. Remove from heat after 5 minutes and let cool completely. Step #6: Strain and taste. Line a bowl with a metal strainer and pour the mixture into it. Stir and press the solids until no liquid remains in the strainer. This is time-consuming, so you must be patient. Step #7: Bottle and enjoy! Funnel the sauce into bottles and seal. Keep refrigerated for up to 6 months. Lisa Trifiro is a self-taught chef and entrepreneur whose recipes have run in Bon Appetit and The Huffington Post. She built and sold a company dealing in artisanal sugars and exotic salts, and she recently competed in the World Food Championships, Bacon Category.